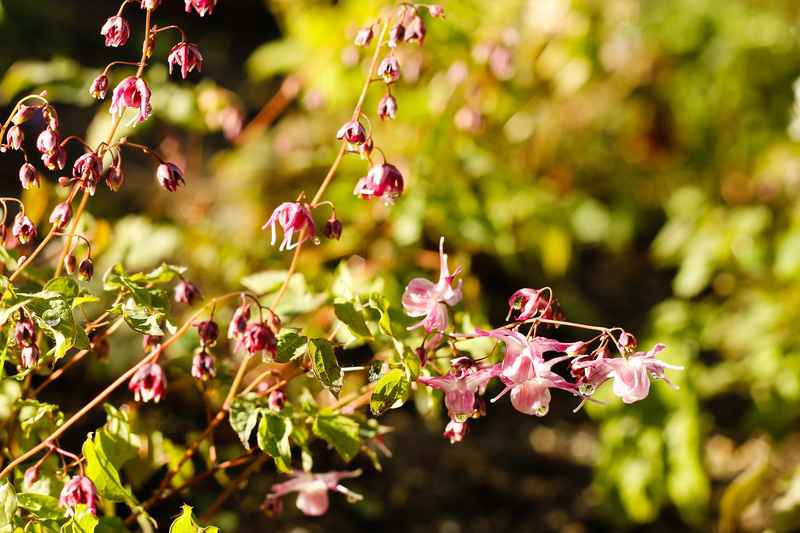 Epimedium grandiflorum ‘Lilafee’, also known as Bishop’s Hat, is one of the more graceful plants you’ll find dwelling among woodland groundcovers. Epimedium grandiflorum ‘Lilafee’ has larger flowers than most with particularly long spurs, resembling the points of a bishop’s hat, hence the name. The amethyst flowers appear in April, dancing above the foliage. Although the flowers are delicate and beautiful, it is the foliage that shines. Spring leaves emerge with faint, ethereal colors. Floating above the forest floor on their wiry stems, the heart-shaped leaves provide a pleasing contrast to the neighboring robust pachysandra and fine ferns. The colder fall nights have brought a copper hue to the leaves, providing gentle warmth to the blanket of fallen tawny leaves. A closer inspection of the foliage reveals tiny circles cut into some of the leaf edges. This type of damage seems almost too perfect to be the work of an insect, but it is indeed the characteristic mark of leaf cutter bees (Megachile rotunda). Leaf cutter bees are small native bees that are important plant pollinators. They are non-aggressive, solitary bees that produce only one generation a year. They use small pieces of leaves to line their nests, producing only aesthetic damage. Thus, an informed gardener will often delight in seeing notched leaves as an indication of native pollinators. Epimedium grandiflorum ‘Lilafee’ is also surprisingly hardy for such a delicate-looking plant. 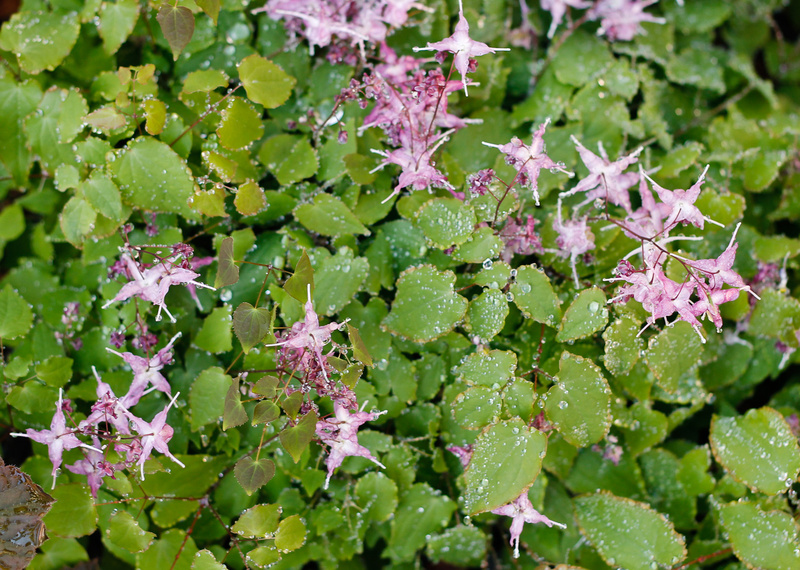 Although they prefer moist soil, Epimedium grandiflorum ‘Lilafee’ is known as a great groundcover for dry shade. Rhizomes provide needed moisture throughout the hot summer months. They are able to hold their own when competing with tree roots and are deer resistant. Slower to establish than some other ground covers such as Lily-of-the-Valley, they will continue to grow steadily over the years with low maintenance. Epimedium grandiflorum ‘Lilafee’ prefer moist, free-draining, humus-rich soil and cool shade with some shelter for the newly emerging leaves. Try to avoid sites with afternoon sun, which can burn foliage. They cannot tolerate alkaline soil. Propagate by dividing in fall. Epimedium grandiflorum ‘Lilafee’ may also be sold as Epimedium grandiflorum ‘Lilac Fairy. On the High Line between 25th and 27th streets. The High Line’s planting design is inspired by the self-seeded landscape that grew up between rail tracks after the trains stopped running in the 1980s. Today, the High Line includes more than 500 species of perennials, grasses, shrubs, and trees—each chosen for their hardiness, adaptability, diversity, and seasonal variation in color and texture. Some of the species that originally grew on the High Line’s rail bed are reflected in the park landscape today. Our horticultural team counts on members and friends like you to help keep the High Line thriving. Join our community of supporters who play an essential role in the High Line’s most important gardening projects.